You may have noticed an icon on your Dashboard and in your course Home page that says “Items need review”. In the below example, “1 item needing review” means that your instructor has graded an assignment, test, or discussion, and that you have not yet reviewed the feedback and score. When you see items that need to be reviewed, click on the icon. You will get a pop-up, with details as to how many items have been graded and are ready for your review. In the below example, the student needs to review feedback in discussions. 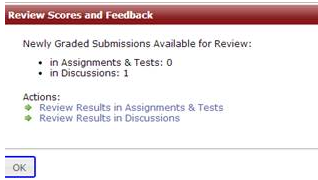 You will need to click on the links under “Actions” to be taken to the graded assignments to review the feedback. Once there, click on the yellow alert icon. It indicates that the item needs your attention. Once you review your instructor’s feedback, the yellow alert will go away, and the number of items needing review will also change. Your instructors have the ability to see whether or not you have reviewed their comments and when.